Wow. Wow. WOW! I think we have hit a new level of shopping extravaganza. Missoni for Target has burst through the Twittersphere, the fashion worlds, the national news, and even gotten our boys to ask, “What’s Missoni?” There is no doubt, Missoni for Target has arrived. And, it has arrived so well, that the Target site crashed, we all became all too familiar with Woof! and most of the Missoni for Target line is already long gone. I was one of the insane, although some would call genious…. ;) hee hee, freaks that tried at midnight on the 13th to score some loot online and with no luck, set my alarm to get up at 3 am and try again. To my crazy excitement, that plan DID work, and I scored about 80% of all the things on my list. (You know you had your list a week before the launch too. ;) ) Sadly, as I was loading my cart online, things were not only already sold out but were disappearing from my cart! I was soooo angry! That was the flag that this was going to be a blood bath. I quickly added the rest to my cart and successfully, checked out and got my email confirmation about 30 minutes before the epic Target website crash. I showered and got myself ready for the madness that would ensue at the store. I strategically picked the store that would likely have the least demand in my immediate area and hung out there for a couple hours before they opened. The poor Target employees were so clueless to what they were about to be thrust into. As the clock struck 8 am, the doors flew open, and the claws came out. I was able to score my pumps. And they are SOOOO adorable. I loved them online and in the commercials but I died for them in person. They are so very soft and just truly delicious. The suede is quite delicate and scuffs very easily, like so much so that the suede scuffs from the inside of the box. The tissue paper the shoes are wrapped in are a necessity to keep them looking as best as they can. And, Scotch Guard is ESSENTIAL with all suede. They run a tad bit on the large size so getting a half size smaller may be an option for some. I fit perfectly into my normal size 7 ½ but I know that others have gone down a size. Sadly, the flats were very poorly made and not made of quality materials. Of the entire Missoni for Target line, I feel that this may be the one major miss for Missoni. I didn’t bother in getting the flats, as darling as they are, because I knew that my $20 could easily go towards that very coveted throw. ;) Which, it did! 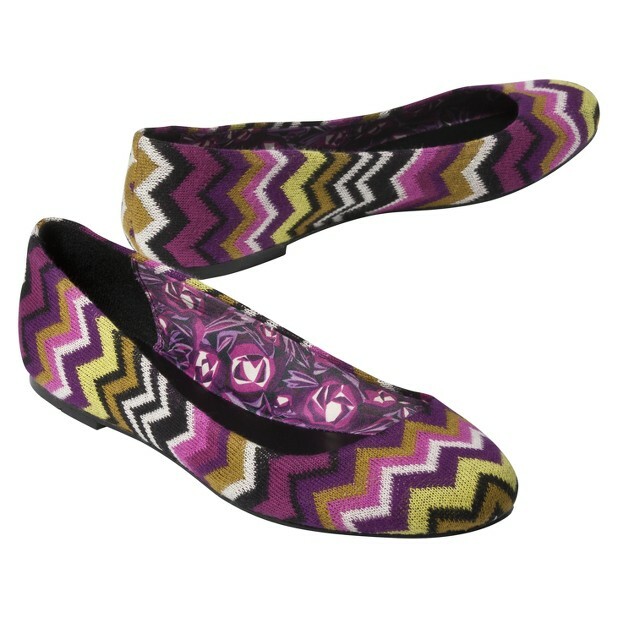 So, for you beloved followers of mine, I feel that this little Missoni pump is such a “Must Have” for every Working Girl’s Shoe Closet that I’m giving away 5 pairs of these little lovelies. Yes, you read that right! All my 7 ½, 8, 8 ½, and size 9 sisters, here’s YOUR chance to score you some FREE MISSONI PUMPS! Tell your friends! Good luck!! Last chance to win is October 31st! 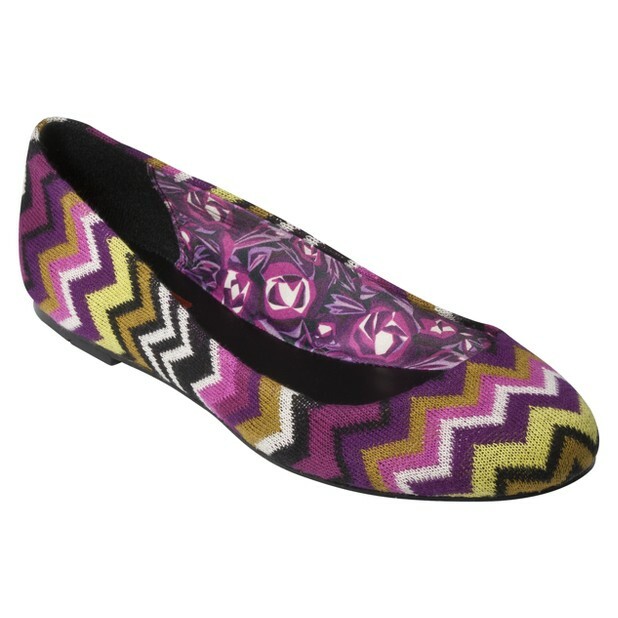 If you scored Missoni, SHARE IT HERE! I love getting pictures! @SassyScorp YAY! I'm so excited for you! Good luck! :) Fingers crossed!! (dumb FB rules) Thanks for making the effort, maybe it will let you post tomorrow? I got a few other things as well, over all I am happy,just really wanted a scarf which I wasn't able to get. Woohoo! This has got be the most AHMAZING giveaway ever! 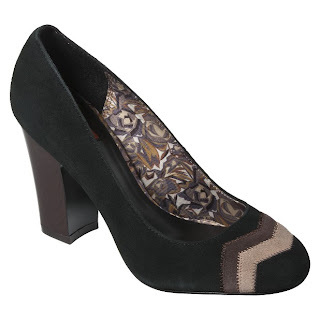 I am in lust with these pumps for months and they were all sold out in my store (long story) and target.com cancelled my order (boo to them!) =) So I've been pretty much heart-broken and can't afford to shell the big bucks for ebay. I am dying and praying hard to win. I am your Fb fan too (San Dalvi). I followed your blog via google, liked your facebook page and we already follow each other on twitter! I follow via GFC. My shoe size is 8. thanks for the chance to win. LOVE this giveaway, so excited! I'm either a 7 1/2 or 8 (will take your advice on fit!). Now a fan of your lovely Facebook Page (and posted my shoe size), Follow you on Twitter, AND Retweeted!